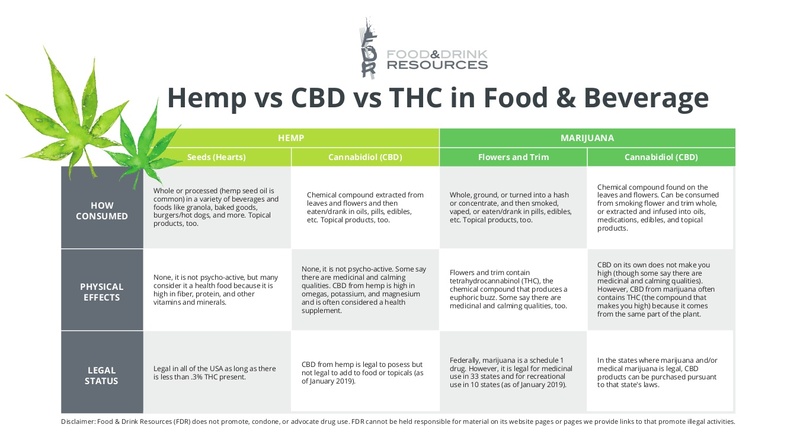 When it comes to understanding the nuanced differences of hemp, CBD from hemp, marijuana, and CBD from marijuana, only a comparison chart will do. CBD comes from the leaves and flowers of both hemp and marijuana and both are likely treated the same by the Feds. Hemp and CBD from hemp are not psycho-active (neither will get you high) whereas CBD from marijuana likely contains some amount of THC (and could get you high depending on the amount of THC present). Hemp oil is made from hemp seeds and does not contain any CBD. Hemp and hemp seed oil are often considered health foods. Hemp oil that contains CBD is something separate. Marijuana can be consumed in many different ways–with the flowers kept intact and smoked or a processed product that allows you to smoke or vape concentrates and eat/drink any number of edibles…plus even more. All of the information here is described to the best of our knowledge and is current as of January 2019. It’s likely many of the laws and production methods surrounding cannabis will change quickly.